Join us for a peak summer weekend of all things good: yoga, nature, nourishment, and exciting new knowledge. Every yoga pose offers an opportunity to consciously work with your chakras. Integrating this into your practice enriches your experience and sends the well-being benefits through the roof. Through teachings, practice, and discussion we will explore the relationship between chakras and particular glands, organs, and physiological systems; and the impact that our personal actions, thoughts, emotions, and experiences have on each chakra. 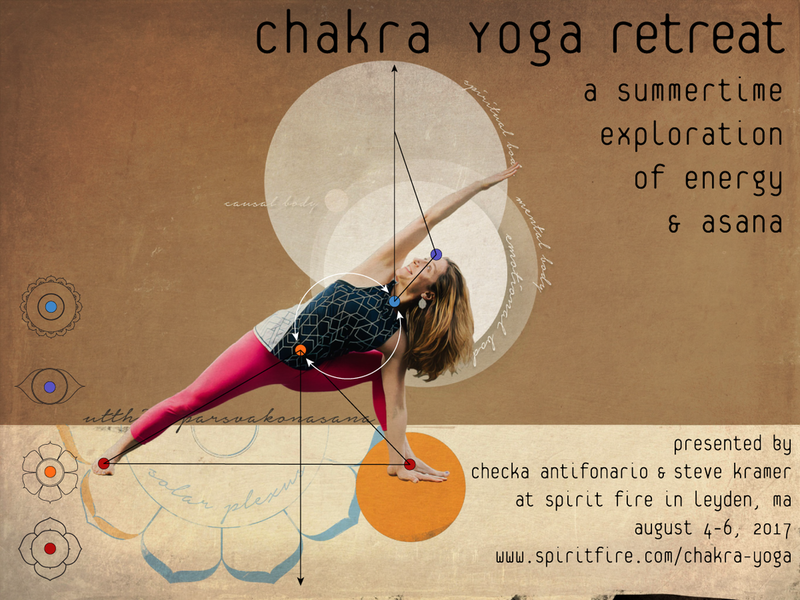 Our weekend together will awaken creative ways to engage the entire chakra system on and off of the mat. This retreat will also include free time to enjoy Spirit Fire's peaceful surroundings and the warmth of community. along with delicious meals and free time to connect and relax! ​Our retreat will begin at 1:00 pm on Friday, August 3 and ends after lunch on Sunday, August 6. The price includes your double/triple-occupancy room, all meals, and full access to the grounds as a private group for 3 days & 2 nights. Steve Kramer and Checka Antifonario are thrilled to be leading this retreat together! They met several years ago when Checka led her first yoga retreat at Spirit Fire Retreat Center, where Steve is a teacher, manager, and chef. They became fast friends through their mutual love of meditation, teaching, and energy work. The pair is excited to combine their strengths to support you on your journey of self-awareness and creativity... and to gather for this training at such a special place! Steve has devoted much of his life to the study and practice of Esoteric Healing, an in-depth form of subtle energy healing that works to align an individual with their inner-most source energy as a way of clearing any distortions that may be keeping them from the fullest, most authentic version of themselves. He has written and taught extensively on the topic of Chakras, and is excited to see the growing interest in energy systems within the yoga world. ​Checka's teaching has been consistently rooted in energetics over the past ten years, with Chakra Flow workshops and Reiki energy healing being highlights of her schedule. When she began studying with Steve, whole new worlds of understanding and connection opened up, and completely refreshed and deepened her offerings. It was like the transition from observing a beautiful rainbow to understanding how and why that rainbow came to be! Breathe, expand, strengthen, and relax while cultivating deep roots of contentment; these are the intentions Checka holds for her yoga students when leading classes, workshops & retreats. Steve has been practicing Esoteric Healing, a chakra-based energy healing modality, since 2001. He is a certified teacher through the International Network of Energy Healing, and a certified practitioner through the National Association of Esoteric Healing. His interest in energetic anatomy and subtle energy systems began after a minor snowboarding injury saw him on the receiving end of an Esoteric Healing session. He was forever changed. This chance event sparked a lifetime passion. Studying, teaching and practicing Esoteric Healing has provided Steve with the opportunity to court new levels of awareness that have fostered delightful transformations and consistent spiritual growth. 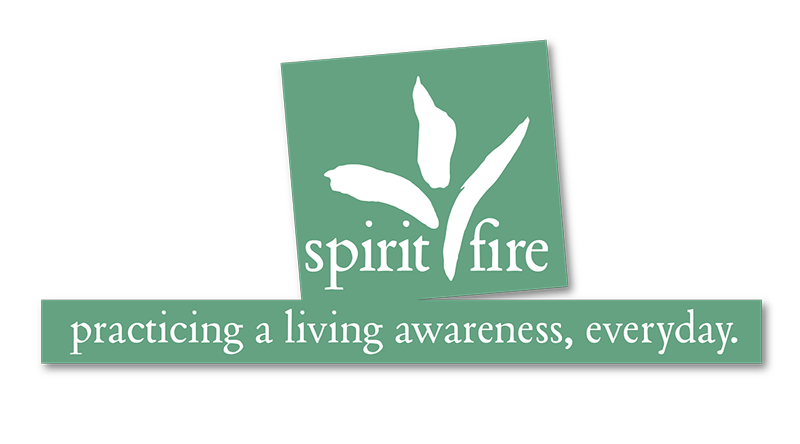 Steve is also a Reiki Master practitioner, a certified teacher of The Practice Of Living Awareness meditation technique, and the President of Spirit Fire, a 501(c)3 non-profit educational organization focused on cultivating spirituality and educating people on the importance of consciousness in their everyday lives.